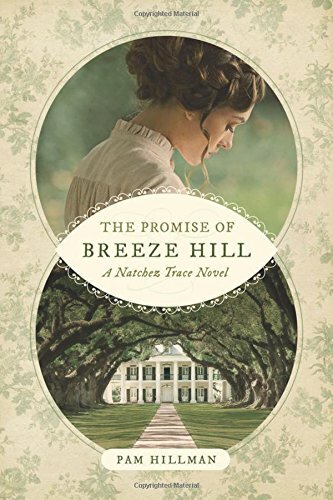 In “The Promise of Breeze Hill” by Pam Hillman readers meet Isabella Bartholomew, who is in desperate need of a carpenter to repair the damages from the suspicious fire that devastated her family’s plantation and almost killed her father. Isabella purchased an Irish carpenter named Connor O’Shea from an auction in Natchez, MS. Connor’s only concern is to finish working out his contract for two more years until he can successfully bring his brothers to America. He doesn’t want to make previous mistakes so he tries to stay clear of the beautiful Isabella. However, it proves to be harder than he had thought. The more time Connor spends with Isabella the more he falls in love with her. But, because of a prior relationship he keeps pushing Isabella further away. The responsibilities of Breeze Hill had fallen on Isabella after her brother was murdered on the Natchez Trace. Isabella’s father believes some mysterious cutthroat/highway man is after the family’s plantation after several suspicions incidences occur. Isabella and her father are determined to save their family’s plantation. This is a beautiful story I really enjoyed. One of my favorite parts of this novel is when Isabella’s faith is tested. I enjoyed watching her spiritual journey back to God. I was touched by the author’s ability to capture the essentials of the human soul. This novel is bold, entertaining, and brilliant all at once, and I was completely engulfed in the story from start to finish. I praise Pam Hillman for her wit, style and intelligence. She has become one of my favorite authors after reading this novel. The narrative has great pace and balance, and the characters are well-developed. I highly recommend “The Promise of Breeze Hill” by Pam Hillman. It is a mesmerizing novel you won’t be able to put down.